Since last I wrote, my life has pretty much been dedicated to Heather's wedding. Well, that and a brand new job (info to follow soon). You know, things like planning fun surprises for the bride, writing my Maid of Honor speech, and placing the standard bets with the Jersey crew on who would do what at the event (i.e. blackout, hook up, cause some sort of regrettable scene, etc). After a year of colorful anticipation, we had arrived at the final countdown. And I was ready. 10) Realizing just how well I know the bride's personal style upon gifting her what I thought would be a transformational garment: a pair of hanky pankies for secret debut at the rehearsal dinner. Surely, she didn't know about this change-your-life-forever brand of underwear as I had just found out about them in the last year from a friend of mine who tends to be "in the know" when it comes to the latest in intimate apparel. And I just knew Heather would love them. When the bride-to-be opened the little package, she started laughing. "What?!" I questioned her, perplexed at how she could laugh in the face of high art. It turned out that not only did she know about this bar-raising underwear, but she was wearing a pair at that very moment in the exact same color that I had picked out for her. Now if on-the-money undergarment selection isn't indicative of true friendship, I don't know what is. 9) Discovering a fantastic new candy bar, hailing from the Garden State. 8) Learning first-hand what the groom and his groomsmen do the morning of the wedding while the bride and bridesmaids are busy with the make-up artist and hair stylist: eat horrifying amounts of fried chicken while screaming at the football game on TV. And all these years I had been thinking they were sitting around, talking about what the groom should name his future babies! 7) Successfully not laughing at the alter during the serious part of the ceremony, which is more than I can say for prior bridesmaiding endeavors. (Sorry, Trace. I owe you forever. Plus, I blame Jill.) Turns out the strategy is to never make eye contact. With anyone--especially not my mom. No matter what. 6) Getting to sleep in the bridal suite the night before the wedding...just Heather and I...in our pjs. Do I lose points from my Maid of Honor score if I failed to notice when the bride woke up in the middle of the night and ordered The Hangover on demand? Not exactly the movie you want to watch the night before your wedding. 5) Busting an unnamed male friend for knowing every last word to It's Raining Men while singing along on the dance floor. 4) Hanging out with the old school crew on the bank of a lake (where the reception was held) around a bonfire...in a bridesmaid dress, high heels and full make-up. Note: there's something about kickin' it in the great outdoors that makes it ok to drink a glass of wine that accidentally got sand in it, heels or no heels. 3) Watching the audience's faces when the best man introduced his speech by announcing that he would be reciting a poem that he had written for the groom called, "Love Is Like A Kitten's Breath by Nathaniel Chase Millett." Let's just say there was some serious laughter/relief going on when he followed this announcement with "What? Come on, already. I'm kidding, you guys. But what I will tell you is a story about this one time when Todd got so wasted that..."
2) Sending the bride off to the church in an antique car with her proud dad sitting next to her. The sound system was playing "Going to the Chapel" and champagne was chilling inside so that it would be cold for the bride and groom after exiting the church as Mr. and Mrs. Koehler. And that it was. 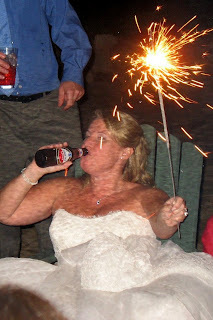 1) Watching Heather double fist an Amstel Light and a sparkler while wearing her wedding gown. Sitting in an Adirondack chair underneath the stars, she had a huge grin on her face as her husband, brothers and oldest friends proceeded to rip on one another with everything they had. And that moment, my friends, is the first page to Heather and Todd's story of happily ever after. See photo below.